Long time no post on Blogspot! I just got back from my honeymoon to NYC (left just ahead of Hurricane Sandy) and have been trying to catch up on things at work, etc. But I'm back doing tutorials, although I've only been able to update my Tumblr in the past week. I thought it was time for something that was neutral and relatively easy to do, but still packed a bit of drama, AND converted quickly into a more colorful fun look for the evening. This follows a dramatic cat-eye liner shape that is quite typical of Italian screen stars like Sophia Loren, but instead of using very harsh and strong black liner, it's created using black shadow instead. Step 1: For this look, I used a single brush; a pointed pencil brush with a pointed tip. I prefer this shape because it actually allows me to apply shadow in an angular shape just by dragging the brush diagonally downward to the center of the eye. Fill in the outer corners of the eye in a thick angular triangle using the black shadow. Step 2: Dust off the brush on a piece of clean napkin and then pick up the soft medium brown. You want to stack this on top of the black earlier, overlapping it a bit so there is no harsh line between the 2 shades. This time, angle the shadow down almost to the inner corner of the eyes. Step 3: The last step on the lids is just applying the softest beige shade from the inner corner outwards. The only difference is that instead of going straight up in a triangle like the other 2 colors, this shade curves in an arc along the socket line before straightening outwards at the outer corners. Again, the color should fade into the medium brown without any harsh lines in-between. This shape visually elongates the eye and emphasises an almond shape. Step 4: Finish by lining the lower waterline with black pencil, and then applying mascara or false lashes. The final look is subtly-dramatic and goes easily with both a soft or a dramatic lip. 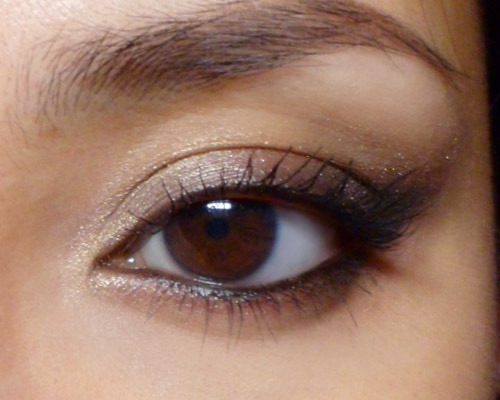 Step 5: The optional step for converting the neutral eye into a play-time look. 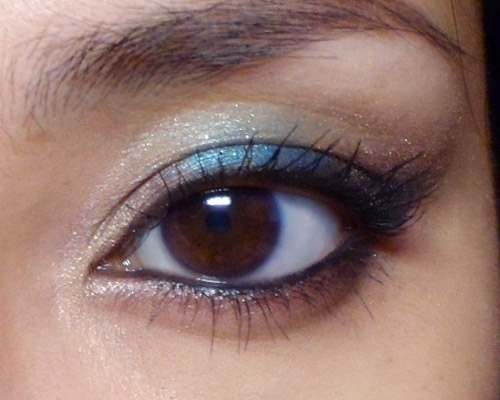 I dabbed a bright turquoise cream shadow down the center of my lids using my ring-finger. Don't smudge back and forth; just tap to blend a bit. You want the color to be distinct and not muddy. 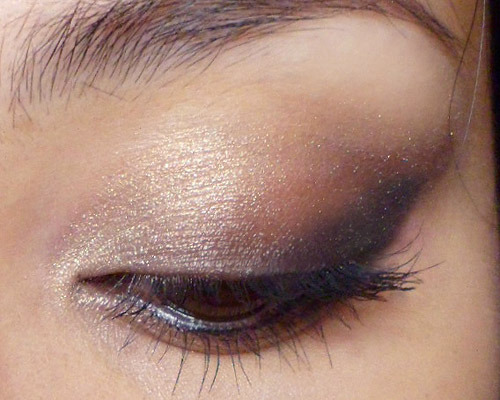 This just gives a nice pop of texture and unexpected color on the center of the lids.